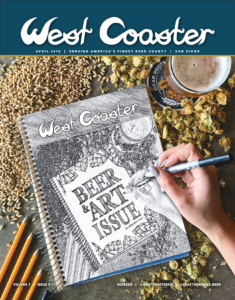 May 5 | Rhythm & Brews: The San Diego Brewers Guild always puts on a good party, and, with breweries and beers from across San Diego County and a full slate local musicians pumping out live music, this is one of their biggest of the entire year. New to this seventh-annual fete this year is a tented VIP area with rare brews and food crafted to pair with those liquid wares. | Historic Vista Village, South Citrus Avenue & East Broadway, Vista, 1 p.m.
May 19 | Arts & Amps: Karl Strauss Brewing’s successful summer art-and-music series kicks off with Boostive and Elektric Voodoo performing at the San Diego stalwart’s outdoor beer garden. Adding extra flair—in addition to 20 taps of local craft beer—will be live mural art from Cohort Collective and a gallery show by Creative Souls on the West Coast. | Karl Strauss Brewing, 5985 Santa Fe Street, Pacific Beach, 4:30 p.m.
May 19 | Fifth Anniversary Celebration: It’s been a half-decade since Stone Brewing took over an old Navy mess hall and converted it into a vibrant, brewery-equipped fortress offering an ever-changing array of innovative house beers, many of which will be on tap along with a special anniversary IPA served in tandem with eats from vendors at the next-door Liberty Public Market during their five-year soiree. | Stone Brewing World Bistro & Gardens – Liberty Station, 2816 Historic Decatur Road, #116, Point Loma, 12 p.m.
| Over the Line Beerfest & Tourney: Booze and over-the-line have always have always gone together, but this tournament, which will include 120 OTL teams, ups the quality of the former considerably with a full-on, four-hour craft-beer festival taking place smack dab in the middle of tournament play. As organizer OMBAC puts it, “you can’t say OTL without beer.” Hear, hear. | Mariner’s Point, 1100 West Mission Bay Drive, Mission Beach, 12 p.m.